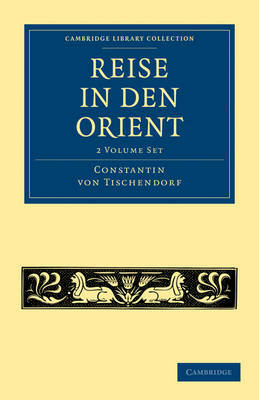 Reise in den Orient (1846) is the German biblical scholar Constantin von Tischendorf's recollection of his journey to Egypt, Israel and Greece at the beginning of the 1840s. The work is a travel diary that vividly describes Tischendorf's meeting with mythological places and impressive men, and a learned account of the Christian history of the area. Volume 1 describes, among many other encounters, his extraordinary and significant discovery - a fourth-century manuscript, one of the main witnesses to the Septuagint. Thereafter he sets off for Jerusalem, and Volume 2 largely focuses on his time in Israel, giving an historical account of Jerusalem as the centre of all religions. On his return journey, he is enraptured by Smyrna and Constantinople, and enjoys visiting the Athenian Acropolis and the other ruins of the ancient city.